Banerjee, K., Ramesh, S., G, R., Nidheesh, P., Bharathi, K. (2012). A Novel Agricultural Waste Adsorbent, Watermelon Shell for the Removal of Copper from Aqueous Solutions. 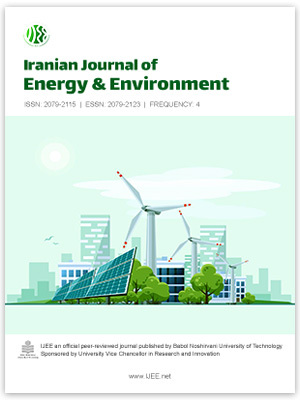 Iranian Journal of Energy and Environment; previously called: Iranica Journal of Energy & Environment, 3(2), -. Koel Banerjee; S.T. Ramesh; R. G; P.V. Nidheesh; K.S. Bharathi. "A Novel Agricultural Waste Adsorbent, Watermelon Shell for the Removal of Copper from Aqueous Solutions". Iranian Journal of Energy and Environment; previously called: Iranica Journal of Energy & Environment, 3, 2, 2012, -. Banerjee, K., Ramesh, S., G, R., Nidheesh, P., Bharathi, K. (2012). 'A Novel Agricultural Waste Adsorbent, Watermelon Shell for the Removal of Copper from Aqueous Solutions', Iranian Journal of Energy and Environment; previously called: Iranica Journal of Energy & Environment, 3(2), pp. -. Banerjee, K., Ramesh, S., G, R., Nidheesh, P., Bharathi, K. A Novel Agricultural Waste Adsorbent, Watermelon Shell for the Removal of Copper from Aqueous Solutions. Iranian Journal of Energy and Environment; previously called: Iranica Journal of Energy & Environment, 2012; 3(2): -.